This week I attended the 18th International Conference on Informatics and Semiotics in Organisations, held at the University of Reading. The theme for this year’s conference was Digitalisation, Innovation and Transformation, and over three days we got to hear a wide-range of talks on Business Intelligence, Data Visualisation, Technology Acceptance, Strategy Lifecycles, Digital Games and Voice Interfaces. It was also a privilege to be able to attend a keynote talk from Emeritus Professor Ronald Stamper, known for his pioneering work in Organisational semiotics. We submitted a paper titled: “A Framework to Support the Design of Digital Initiatives in Social Science-Based Research”, which outlines our findings and reflections on our approach to digital transformation in the Faculty of Social Sciences. In the paper, we propose a framework to assess and implement digital transformation in a research context. 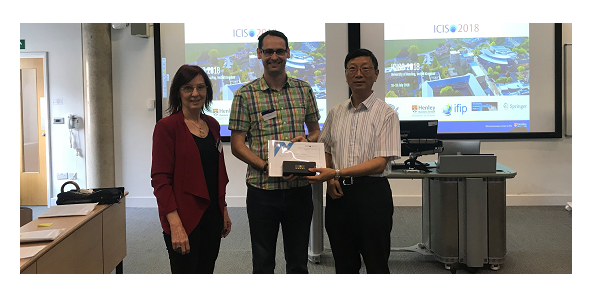 With over 30 peer-reviewed papers accepted to the conference, it was a genuine surprise to learn that our submission had been given the best paper award by the programme chairs. With so many fascinating papers and contributions, it is extremely rewarding for the work of our team to be recognised by the academic community as pushing the boundaries of digital transformation and digital support in research. This strongly reinforces our view that the most effective way to help researchers to work at the cutting-edge is for us to be working there too alongside them. Following the conference, I am now interested in exploring how we might apply our Digital Research Ideation Cards in making the principles and frameworks of Organisational Semiotics more accessible as a research tool.